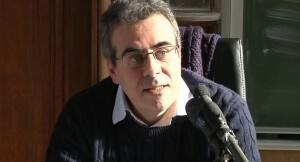 Born in 1966 in Grenoble (France), of French nationality, Rémy Herrera is an economist, researcher at the Centre national de la Recherche scientifique (CNRS, National Center of Scientific Research). Graduated from École supérieure de Commerce (Business School, 1988), and the Institut d’Études politiques de Paris (Institute of Political Studies of Paris, 1990) and the University of Paris 1 Panthéon-Sorbonne (Master of Philosophy , Ph.D. in Economics, ), habilité à diriger des recherches at Paris 1 (2002), he supervises doctoral theses at the Centre d’Économie de la Sorbonne. He started working in the financial audit (1987-1988), the Secrétariat général de la Défense nationale (SGDN or General Secretariat of National Defense [military service], 1992), and the Organisation for Economic Cooperation and Development (OECD, 1992-1997) and for the World Bank (1999-2000). He was a member of the National Committee of the CNRS (2000-2005) and the Scientific Council of Paris 1 (2001-2002, 2005-2006). He chaired a committee of experts of the Agence d’Évaluation de la Recherche et de l’Enseignement supérieur (AERES or Evaluation Agency for Research and Higher Education, 2011). He has taught at various universities in France (Paris 1 [1993-2013], in particular) and abroad, including the Faculty of Social Sciences of Aleppo (1998), the University of Cairo (1999-2000) and the Universidad Complutense de Madrid (2009-2013). He is or has been associated with the Union of Radical Political Economics (New York), the International Initiative for Promoting Political Economics (London), the Sociedad Latinoamericana de Economía Política (São Paulo), the Asociación Nacional de Economistas de Cuba (Havana) and the Forum du Tiers-Monde (Third World Forum, Dakar). It was one of the coordinators of the World Forum of Alternatives (WFA) and an expert adviser to international research programs at the University Chubu (Nagoya) and Lingnan University (Hong Kong). He works regularly with the Centre Europe – Tiers Monde (Geneva), supporting it in its advisory role to the Council of the United Nations Human Rights (UN).